The initial structure of the Harvey Course mimicked precisely that of the medical Course taught in Italian at the University of Pavia. changes introduced in 2012/13 and 2013/14 instead gave the New Harvey a distinct profile and a new syllabus outlined here and detailed in the dedicated Harvey web site. The phylosophy underlying the new Harvey syllabus and is described briefly below. The Course aims to educate a new generation of physicians to a rigorous, scientific understanding of the causes of disease (biological and social), the mechanisms of disease development and progression and rational approaches to prevention and cure. In order to fulfill the Course mission, the following steps were introduced as part of the new Harvey, largely so in the preclinical Harvey (years 1-3): (i) the overall number of lectures has been reduced and lecturers are prompted and expected to provide students with original lecture handouts ahead of the actual teaching, (ii) a new and extensive programme of teaching seminars has been introduced addressing major areas of contemporary medical research with high impact on medical practice; (iii) the number of laboratory practicals has been vastly increased in order to provide students with first-hand experience of key advances in laboratory medicine, (iv) all lecturers have been requested to deliver a week long end-of-course revision tackling key exam topics, (v) a large programme of newly-styled supervisions has been introduced, (vi) examinations have been made compulsory and have to be sat by all students at the end of all Courses, (vii) the number of exams has been reduced from 36 to 24, (viii) the number of exam sittings has been reduced from an average of 7 sittings per year (in the medical Course taught in English) to 3 per year and, (ix) the topics of the examination are the ones covered in the Course and subscribe to the ‘Ask what you teach, teach what you ask’ philosophy. The Harvey Course teaches all key pre-clinical subjects often bringing together subjects that, in the traditional Italian Course, are typically self-standing. For example Genetics and Biochemistry are brought together in Living Molecules; Embryology, Histology and Anatomy are brought together in Structure of the Body; Physiology, Systems Biology and the Biochemistry of specialised cells and tissues are brought together in Functions of the body; Virology, Baceriology, Parasitology, Immunology, General Pathology and General Pathophysiology are brought together in Biology of Disease and so forth. In addition, the new Harvey syllabus has introduced several new subjects deemed to be essential (Social Roots of Health and Disease in year 1 and Ethics, Medicine and Society in year 2) or optional subjects important for understanding the biological framwwork of disease or the emerging foundations for targeted therapies (Evolutionary Medicine and Personalised Medicine, both in year 3). The changes brought about by the teaching structure of the new Harvey have yet to filter through the whole six year duration of the Course but have made their way through years 1 and 2 with striking results (see Fig below). The year 1 coohorts of 2014/15 and 2015/16 studied the new syllabus and achieved a 40% improvement on previous years. 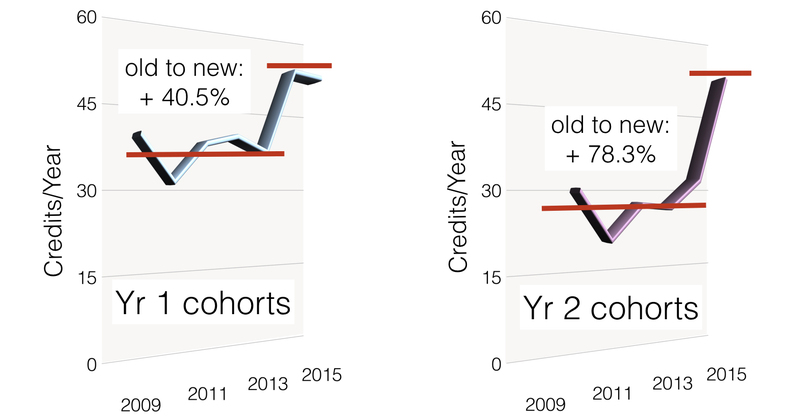 The single 2015/16 year 2 coohort delivered an astonishing 78% increase on previous years. These staggering results await to be extended in coming years but provide remarkable evidence that changes in the teaching methodology can have a dramatic impact on students’ performance. In C Golgi’s time large areas of the rItalian peninsula had endemic malaria. C Golgi decided to investigate this disease given its major social impact. Between 1886 and 1892 C Golgi demonstrated the existence of three varieties of protozoan parasites of the genus Plasmodium corresponding to different types of malaria. He elucidated the life cycle of the parasite in red blood cells and the fact that malaria ‘fevers’ occurred concurrently with the release of the parasite in the blood. In other studies he addressed the effctiveness of quinine in malaria patients. The impact of C Golgi’s work on malaria and it is remarkable that the justification of the honorary doctorate that the University of Cambridge bestowed upn him in 1891 was constructed entirely on his work on malaria and not on the other major contribution that C Golgi had made to the study of the nervous system through his discovery of the black reaction. The image at the top of the page shows a drawing of C Golgi illustrating the red blood cell malaria cycle.